Capillary testing is primarily used to detect surface defects of material. These defects must be associated with the checked surface of the product so that the penetrant can penetrate into their space. The use of PT methods is not limited to metallic materials, but can also be used to check plastics, glazed ceramics, glass and other materials whose surface is not porous and will not be damaged by the application of a penetration substance. The capillary method uses the characteristic properties of phase interfaces and the capillary properties of liquids. The principle behind the method lies in the capillarity action and wettability of individual liquids – penetrants, their color and fluorescence. The surface of the test material is penetrated by a penetrating liquid that gets into all surface defects. 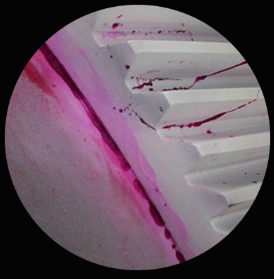 After removing excess penetrant from the surface, the penetrant is left over in the surface defects. Using a developer applied to the test surface, it creates a color indication of the defect.